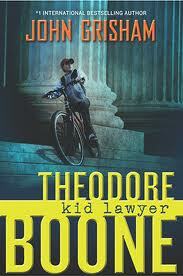 Theodore Boone, Kid Lawyer by John Grisham is about a boy named Theo. His parents are lawyers, and he plans to be one too. He knows every judge and police man in his small town, and people from his school come ask him questions because they all know that he knows everything about the law. When a giant court murder case comes up, Theo is thrilled-until his parents say he still has to go to school. But when the guilty man is about to go free, Theo learns something that will change everything. I loved this book. When you look at it, all the law and stuff makes it look terribly boring, but the book is so action-packed and suspenseful. I love how he is only 13, but he knows so much about the law. There are many twists and turns, which make the book a lot more interesting to read and think about then the typical teen novel. I definitely recommend this series to boys and girls on a 7th-9th grade reading level. What you may not know is that the author of this book is a very famous author of adult novels, many of which have become movies. He’s a pretty amazing writer, and he used to be a lawyer himself! I did not know that.. that is really cool. That’s awesome!!! Wow kinda odd! Yeah, I’ve read this series. It also has a second and third books out, which are also pretty good. I’ve read an adult book of his, which was excellent. Theodore Boone I can definitely recommend. It’s true that it can get boring for someone who’s not intellectual, however.